Rangers Measles -- born 3-31-1975, sired by Texas Ranger and out of Measles. Her dam Measles was unquestionably the top cow in the breed and her sire shared equal value among TL bulls. Rangers Measles was a planned mating with great opportunity value. She was shown at the Colorado State Fair and was All Age Grand Champion cow as a 2 year old, her only shown. She is one of the 8 greatest foundation cows of the breed. 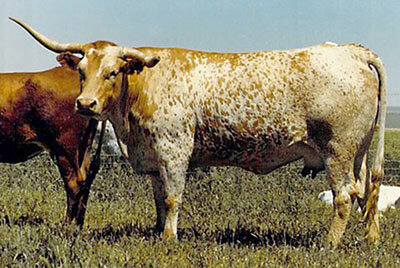 Measles was purchased from the WR sale by Dickinson Cattle Co as a calf for $170 in 1971. She and her progeny were owned and registered in the name of Chad Dickinson. Each of the Dickinson family had their own herd within the herd. Measles was bred to Texas Ranger 7 times. Rangers Measles was her 3rd of the full-sibs. When it was obvious that Rangers Measles was the best of the 7 progeny, and better than her dam, it was decided to sell Measles to help draw awareness to the real value of the breed. Measles sold in the Denver National Western TL Sale for $17,000, a breed record. Her buyers did embryos and later sold her for $200,000 to Red McCombs and H. C. Carter during the Montgomery dispersal sale. In the seventies great interest was moving in the TL breed. Dozens of entry level producers were planning herds, yet very few quality animals were available. Most cattle were under 800 lbs with horns under 35" T2T. The few top cattle were unusual. These few top cattle dominated the foundation pedigrees and now dominate the depth of the most valuable cattle's pedigrees. The great cattle of today go back to the great foundation cattle in their pedigree. Cattlemen criticized the TL breed for being small and not very meaty in build. Rangers Measles was one of the largest in her day and immediately commanded great respect. She had the size of her sire and the very correct type and conformation of her famous dam. When the Dickinson embryo program started up her pregnancies were in great demand selling on order for $12,000 with paid deposits. She produced 44 calves natural and embryo. She was the dam of All American, Emperor, Pring, Impressive, Sequel, Whelm Me, Northern Star, Sena Me, Superior Symbol, Bail Jumper and Tri W Slide Rule. From her 44 progeny a useful segment of the industry was born, of thick, full figured, desirable cattle. Whelm Me and Emperor, full-sibs were purchased by Johnny Hoffman and became the center of his valuable herd. Emperor later sold privately for a reported $150,000. Impressive was used by DCCI for 2 years and sold to Wix Comer for $62,000. Bail Jumper was used by DCCI 2 years and purchased by John T. L. Jones, Jr, later to be TLBAA Get of Sire Champion 4 years. Pring was one of Ben Gravett's first herd sires as his breeding program was heating up. Tri W Slide Rule was the leading sire of the Tri W Ranch. Although Rangers Measles is back a ways in most modern pedigrees there are beautiful females that carry her big correct size, flashy speckled color and flat twisty lateral horn. There are many daughters of Boomerang, Emperor and Bail Jumper grand daughters who have the exact same stamp of Rangers Measles. These are often the largest females in the breed. These over 1100 lb cows stand out, especially when standing beside 800 lb cows. Photo at age 4. Today the influence of Rangers Measles back in the pedigree can be found in Cowboy Tuff Chex, Respect Me, Clear Win, Tempter, Drag Iron, Rim Rock, Sledge Hammer, Jamakizm, Bayou Empress, Delta Fifi, Delta Vixen, Dixie Emperor, Boomerang, Top Caliber, Whelm Me, Jet Jockey, Rio Catchit, and 3 of the 4 over 90" T2T record cows. She was a good one. We thank the Lord for her.